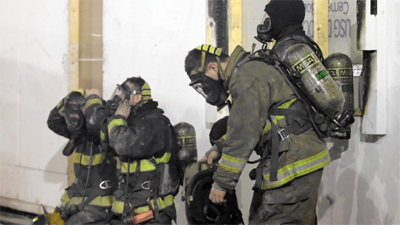 About 100 firefighters from the U.S. and Canada assembled at Northbrook’s Underwriters Laboratories on March 18 to find out if they have more, and safer, choices than they might think as they pull up to a residential fire. Steve Kerber, director of UL’s Firefighter Safety Research Institute, said the traditional way to extinguish a house fire has been to immediately carry hoses in and aggressively attack from room to room, forcing the fire against the outside walls with water. The accepted wisdom finds that attacking through windows from the outside can essentially push the fire into other rooms, and the water, becoming superheated, can “steam the occupants” to death, he said. A combination method, however, involves attacking quickly through windows before moving to the inside. That “transitional attack” — still shunned in many departments, Kerber said, because it involves exterior firefighting — was demonstrated Friday in a test house at UL, festooned with hundreds of sensors. Underwriters has tested the transitional method about two dozen times in the past month as part of a three-year study of transitional attack, funded by a $3.5 million U.S. Department of Homeland Security grant, which will culminate in a report next year, Kerber said. On March 18, a crew of about ten UL-hired firefighters attacked through two windows where separate rooms were on fire, flames extending from the windows. They sprayed the hose water up, not horizontally, to avoid pushing the fire, then sprayed in a circle to hit as many surfaces as possible without letting more air into the room. The flames were gone in each room in about 15 seconds, and temperatures quickly dropped from around 1,800 degrees to 250 degrees, Kerber said. When firefighters headed in to put out any fire that remained, all they found was “one little spot on a chair,” he said. But the transitional method has limitations, both he and the visiting firefighters said. Breaking a window, he said, would introduce air into a fire, making it easier for it to flame through an interior wall. 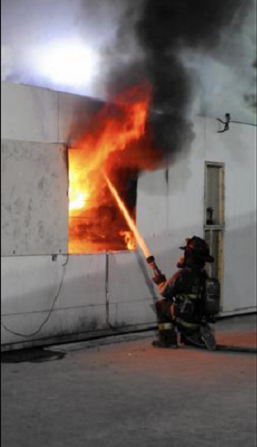 One of the key features of transitional firefighting is that it reduces the time a firefighter is inside a structure while it’s ablaze, proponents say. For firefighters, that’s important. One of the visitors was Winnipeg (Manitoba) Fire Paramedic Service senior firefighter Lionel Crowther, who was burned over 70 percent of his body in a 2007 fire. He said two fire captains died in that fire, including one he was unable to push out a second-story window before he himself dived through it. “I take this pretty seriously,” said Crowther, who supports the transitional attack strategy. Though transitional firefighting has been studied for years, this is the first time it’s been done with so much electronic data collection, and with a component of the effect on human skin, according to UL representatives. UL has been joined in the study by the University of Illinois Fire Service Institute, which is testing how much heat trapped people are exposed to as transitional attack is practiced. Kerber said they’re testing with carcasses of young hogs, which have skin similar to humans, and by exposing rats to similar levels of heat as produced in Northbrook. Results are still being studied, but Gavin Horn, the Institute’s research director, said it’s a myth that spraying water on fire dramatically increases the steaming effect on trapped people. “We’ve been surprised by the amount of moisture created just by the fire itself,” he said. Visiting firefighters watched the fire on screens featuring video footage from eight cameras in and outside of the ranch house. A fire was started with a dropped match and allowed to burn for several minutes before firefighters were given the “go” sign. Kerber said that “flashover,” the point when everything in a room catches fire, usually occurs within four minutes. Fire Chief Brad Shull, of the Jefferson Twp., Ohio, fire department, said many fire departments don’t even reach a scene before seven minutes have passed, indicating departments may be playing catch-up more often that they thought. Kerber said the use of the hoses in the transitional method can keep air from fueling the fire, but McCulloch said later that the demonstration model didn’t replicate many of the situations fire departments find in America’s wealthier suburbs. “A three-bedroom ranch isn’t a 5,000 square-foot McMansion, where you’ve got a lot of air to feed a fire,” he said. In such houses, he said, there may be no choice but to start firefighting from within. He said one of the best ways to cut down the oxygen fuel of a fire is up to the residents of the home where the fire has started.